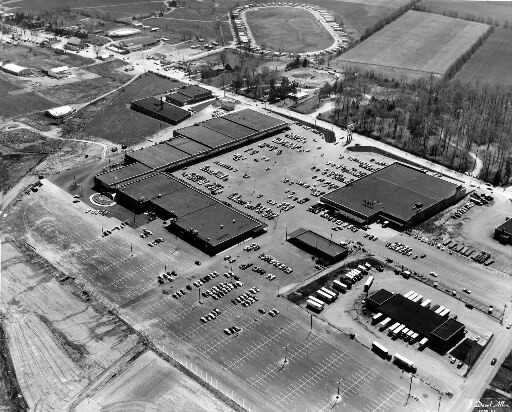 This photo, courtesy of Gene Schenck, shows the York County Shopping Center in 1955, center. Back in 2013, some Ask Joan readers wanted to know what the circle/oval toward the top of the photo was, and in 2018, an answer finally appeared. In the past couple of weeks, I’ve had the (sad) privilege to attend memorial services for two people I met during my time at the York Daily Record – Jo Ott, a longtime reader and friend, and more recently, Donna Hollinger, who served as the YDR’s receptionist for 60 years. I was privileged to work with Donna for the last decade before her retirement in 2009, and I can tell you she was just amazing. Others from the YDR have written extensively about Donna and her contributions, and I couldn’t begin to top those tributes, but I do owe Donna one final thank you. But in this case, I owe Donna my gratitude because, when I went to her visitation, I had the unexpected chance to talk to a number of Ask Joan readers. When I’m out and about in general, with some regularity, I hear “Are you Joan from the newspaper?” It does still catch me off guard at times, though, and the gathering in honor of Donna was one of those times. During the hour and a half or so that my fiance, Dan, and I were there, we got to talk to Deb Hummel (herself a former YDR copy editor and one of the people who was instrumental in training me in the ways of newspapers). I also spoke with Roger “Goofy” Lang and his wife Jackie Lang, who were neighbors of Donna’s; a woman named Barb, who had known Donna since the 1970s and who bowled with her; and a gentleman named Earl, whose father, also Earl, was a former managing editor of The Gazette and Daily, the YDR’s predecessor. It was especially fun when Barb and Goofy got started talking about how excited they were about the recent columns on Huntley’s Hamburgers. Goofy had remembered there being an A-frame eatery in that area, but absolutely could not place the name or get anyone else to recall it, and Barb had a similar story. The two of them together were absolutely ecstatic to see it talked about – and to talk to each other about what they remembered about it! This great group easily provided me with ideas for what could be a dozen future columns. Today, I want to share some of the things we talked about, because I have a feeling many other readers can share their thoughts on these topics and keep the conversation going! Barb was so fun to talk to. She was introduced to me by YDR front-desk receptionist Linda Gracey, because she had told Linda she had been wanting to meet Joan from the newspaper for several years, and Linda brought her over. Amazingly, Barb was able to clear up a mystery that has plagued me since 2013. The photo you see with today’s column is an aerial view of York County Shopping Center in Springettsbury Township, but when I first wrote about it more than 5 years ago, a reader raised a great question: What was that circle/oval at the top? Barb told me she knew the answer to that as soon as she saw the picture. It turns out that was a trailer park in which the trailers were arranged with a large open area in the center. She and her family lived on one side, and her grandparents were on the other, and they’d walk across that open space to visit. I was so excited to solve that mystery! Deb Hummel had some really great ideas for future column subjects. We talked for quite a while about the idea of local news and local history in general – including, specifically, how there’s value in the “little” things that maybe only a handful of people will recall, but which were important or notable to those folks. For example, Deb sat next to a gentleman at one YDR Christmas party and they both recalled such a thing: Where Fat Daddy’s sits today on East Market Street – also near the York County Shopping Center – was once the Lincoln Woods Inn. In front of that eatery, for a period of time around the 1960s, was a mile-marker signpost showing the distance from that spot to Korea as well as to other locations. Deb wondered what the connection might have been – did the owner have a relative who had been in the Korean War? Deb also mentioned another very important topic – candymaking. This is a candy area, she pointed out, and not only do we have Fitzkee’s, Wolfgang’s, Anstine’s, the original York Peppermint Pattie, etc., there were any number of other candymakers, like Katharine Beecher, whose buttermints were one of my favorite candies growing up. Deb had written to me before about a local favorite, Klein Grade A Chocolate Squares, the recipe for which she had heard may have been bought by the Wilbur chocolate company, maker of Wilbur Buds. Deb pointed out that the Agricultural and Industrial Museum doesn’t include an exhibit on this big topic, and I realized that while we’ve talked about individual candies here and there over the years, we haven’t really focused on that topic, and I’d love to hear more about what you remember of the various candy houses! Goofy was great to talk to. He delivered papers for many years and has a truly remarkable memory of what used to be where. He was a “Swamper” – he grew up in the neighborhood of York in the area of North Duke and Arch streets, the area where the Revs’ stadium is today. He and Jackie knew each other in school, and graduated only a couple of years apart. But he had a question. He remembers that what’s now York County School of Technology – then York Vo-Tech – opened its doors for the 1964-1965 school year. What he doesn’t know is whether they had a graduating class in 1965. He thought there was one in maybe ’66, but wasn’t sure about 1965. The school’s website lists info for specific alumni back to 1967, but of course there could be earlier ones whose info just isn’t available. I’d be very interested in knowing what others remember about this as well. One thing that many of Donna Hollinger’s former coworkers will remember is that she was always connecting people with info. People called her every day with questions on a wider variety of subjects than I could begin to list. In every real way that counts, “Ask Donna” was the first Ask Joan. So I’m honored that we could both gather to remember her and join together to talk about other memories, because I think she’d have enjoyed both parts.